Here we will list our championship dogs along with a picture, description and each of their pedigrees. We will be adding this information shortly, check back soon. 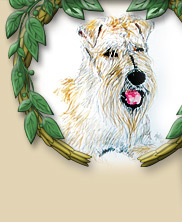 Also, Visit Our Gallery to see some other pictures of our Wheaten family.